In 2006, when Katelyn Colbie Pendleton was 9, her mother, Velma Hare, gave her away to a friend, Kizza Monika Lopez. Lopez soon began intermittently starving and force feeding the girl, and having her sleep in a closet. Lopez whipped Katelyn with plastic coat hangers, threw scalding water at her while she was in the bathtub, burned her with a pan, and punched her in the face. In December 2007, Lopez withdrew Katelyn from the Christian school she had been attending to homeschool her, and the abuse worsened. In April Lopez plunged Katelyn’s hand in a pot of boiling water and held it there. A short time after this incident, a neighbor lodged an anonymous tip with child protective services. The investigator found Katelyn “lying on the floor, starved, dehydrated, beaten and ill from untreated wounds.” At the hospital, her clothing had to be cut from her bloody body. Lopez was charged with aggravated child abuse causing great bodily harm and received 20 years in prison. 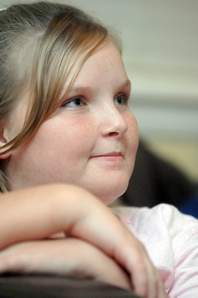 Katelyn survived the abuse and was taken in by loving adoptive parents. She shared her story in an effort to raise awareness for abuse survivors.